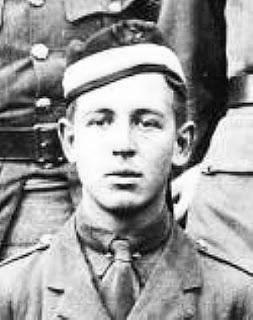 One Eternal Day: "On the morning of April 15, 1918..."
One of the young soldiers with his back to the wall was Second Lieutenant Clive Staples Lewis. A confirmed atheist at the time, C.S. Lewis would survive the storm and steel of the First World War. But the experience of war would transform him, launching him on a spiritual journey that culminated, years later, in his conversion to Christianity. He would earn worldwide fame as a Christian apologist and author of a series of children’s books, The Chronicles of Narnia, which tell the story of “a great war...with all the world looking on,” a battle between the forces of Light and Darkness. A documentary series that is coming later this year (if you don't see a video embedded below, the YouTube link is https://youtu.be/cQdPIk3qc_A ).